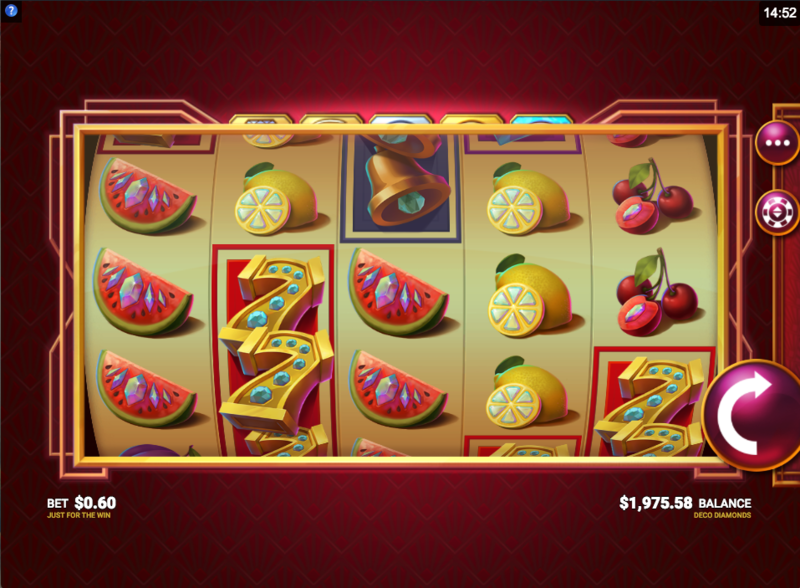 Strutting its stuff at a virtual casino near you is this online slot machine with luxury as it’s theme; it’s called Deco Diamonds, it’s developed by Just For The Win and it combines an art deco style with an abundance of jewels and fruit for an unusual gaming experience and some clever features. Deco Diamonds is a five reel slot with three rows and nine paylines; the art deco influence is immediately obvious when you load the game up and this is a game with some stylish looks and a cheery soundtrack which bring to one’s mind flapper girls and a fin de siecle attitude. The three highest value symbols are all stacked three positions high and include bells, gem-studded sevens and blue diamonds; watermelons, lemons, plums and cherries make up the lower values and they in fact also stacked. The Deco Diamonds symbol is wild and it will replace all others to help form winning combos – it’s also the key to the feature as we shall explain shortly. There’s two parts to this feature and the first is triggered by landing two, three or four of the Deco Diamonds wild symbols anywhere in view; you’ll now receive a free respin with those wilds locked in place. Any more wilds landing will award one more respin and this process continues until there are no more extra ones. If three, four or five Deco Diamonds land you’ll also receive a spin of the Bonus Wheel after the respins. Three, four or five diamonds will also determine which value level the wheel is set to – silver (up to 80x). gold (up to 588x) or diamond (up to 1000x). If the wheel lands on a ‘level up’ segment you’ll get one more spin at the higher level. Deco Diamonds is a very clever slot with some very high quality graphics and some smooth gameplay; the feature is inventive and pretty lucrative when it gets triggered, especially with three or more bonus symbols. There’s a nice high RTP of 97.00%.